This is a blog about the astrology of libertarianism and related topics. Libertarianism is at heart not about being "socially liberal and fiscally conservative" as some say, but about physical non-aggression. This is why I go over the charts of violent events and violent persons and point out the astrological complexes that accompany violence. Understanding the astrological correspondences surrounding aggression and non-aggression both expands the reach of astrology and sheds light on the ethics which underlie political philosophies. The topic of this post is: what, in the chart of hip-hop legend and near-billionaire entrepreneur Dr. Dre, explains his brutal physical assaults on women? I say it's the Bloodbath Formula, which appears nearly without fail in the charts of extremely violent persons. 4. Pluto in the Fourth House. It might not be a stretch to say that the women in his life are lucky to be alive. 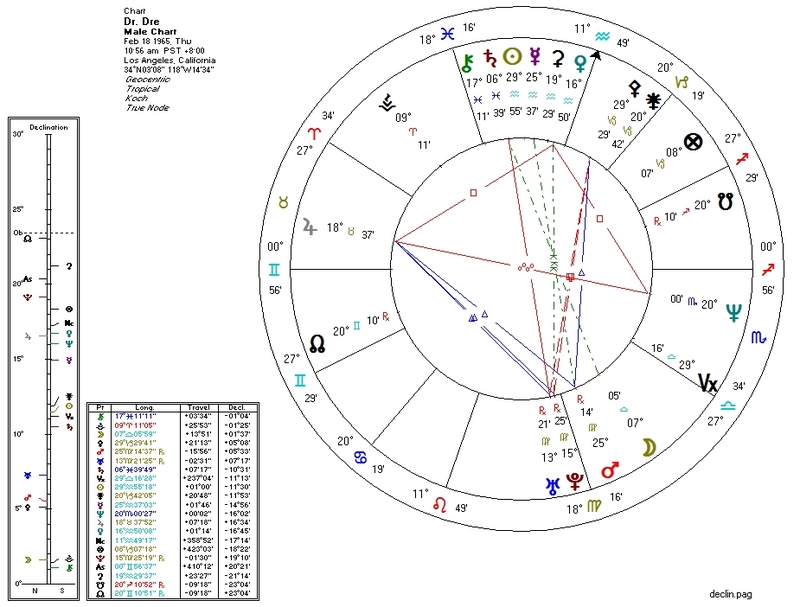 The Jupiter-Venus-Neptune T-square probably has something to do with his compelling and innovative music production. Dr. Dre: great music producer, crappy human being. And: "feminists" who use Apple products and fail to address the insanely misogynistic qualities of hip-hop culture? Hypocrites. August 21, 2015 at 12:30 PM http://www.nytimes.com/2015/08/22/arts/music/dr-dre-apologizes-to-the-women-ive-hurt.html?_r=0 Nothing like bad press to bring out the not-so-credible apologies.